Taking notes on a computer or phone is never going to be as easy as taking notes with a pad and pen. Especially if you used to be a policy debater or ever learned shorthand. You have a method for speedily jotting down all the relevant stuff that’s just light years faster than predictive type and whatever the hell gadgets like the Note 7 promise you can do with a stylus. 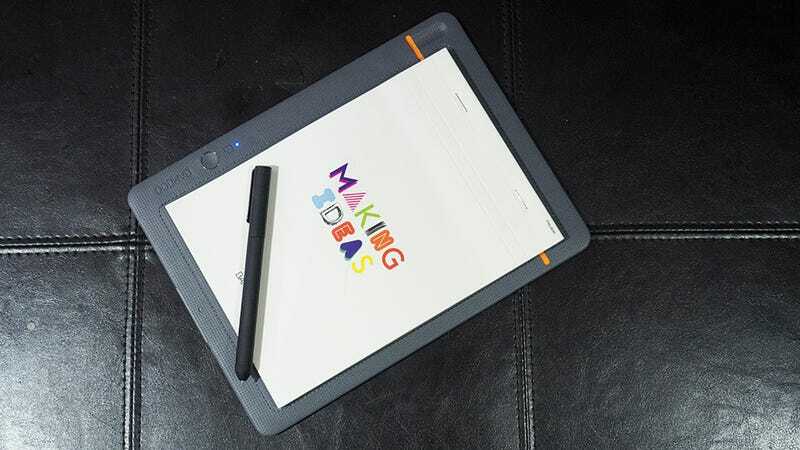 It’s what makes Wacom’s Bamboo Spark incredibly appealing. It’s a pad, pen, and paper that allows you to digitize all of your notes, giving you the beauty of the cloud without all the hassle of hunt and pecking on your phone. The Spark (and the three new products) store everything you write and then upload your scribbles to your iOS or Android device when you next sync it via Bluetooth. It can even tell when you flip to a new sheet of paper, creating a new digital “page” in the accompanying Inkspace app. Wacom had great success with the Bamboo Spark last year, and has returned this year with additional sizes and variations. Some that don’t even include the folder form of the original Spark. The back of all three devices is incased in a very pleasant fabric. There’s the Bamboo Folio, which is a minor upgrade to the original Bamboo Spark and fits an A4 pad of paper, the Bamboo Slate, which chucks the thick and heavy cover of the Folio/Spark and gives users an easy tablet like form to writer on, comes in both the common A4 size and the smaller A5. I’ve dragged the Slater around for the last few weeks, tossing it in my purse, and pulling it out to jot down quick notes at meetings. When the Slate works it’s a seamless experience. It remembers what I write and loads it into Wacom’s Inkpaper app whenever I sync it. From there’s its easy to save it as a PDF and send it to myself, or convert it to a Wacom Will file. Wacom’s special file format has an open SDK, so it can be added to popular apps like Evernote, and it can even be used to convert any notes to a text document. But I’ve had one issue. The damn thing can’t hold a charge. Or it appears unable to hold a charge. If I leave it at home then there’s no unusual battery drain. The drain only happens when I toss it in my purse. That suggests the problem is with junk in my bag accidentally hitting the power button and turning the Bamboo Slate on. So it’s a good idea to protect the Slate when putting them in a bag, because if the battery drains away than the products are nothing more than very expensive pads of paper. The three new products are available now. The A5 Slate will retail for $130, the A4 Slate for $150, and the Folio for $200. For more information and feedback stay tuned to our Facebook Live at 1pm EST today. We’ll be checking out the Folio and Slate with our fantastic staff illustrator, Angelica Alzona. Correction (9/6/16): This post originally referred to the A4 Slate as the Omni.